How to move house with our 60 seconds of top tips. A quick 60 second list on the top things to do when moving house. Start packing early. Packing can be a length process so leave plenty of time. Get some quotes for using a removal company, it may be cheaper than you think if you already have the boxes and are flexible on dates. Get organised start decluttering and use a countdown guide to moving house. Clearly labelling makes life much easier when it comes to loading and unpacking, your know which boxes goes where and will be able to find item quickly and easily. Notify utilities as soon as possible or you may be put on temporary rates. If moving yourself ask friends and family to help, allocate a day early. If hiring a van take time to think about loading items. The first items in the van, lorry, truck will be the last items off. So, if you have things that you need for the first day at your new home, then make sure they are loaded last. De- clutter and spring into Action. One of the main reasons why people find decluttering so disheartening is the sense of being overwhelmed. However there are so many benefits to de-cluttering your life and letting go of old stuff. Not only to make space and get rid of stale energy and emotions but you could make some cash along the way. With spring in the air now is the perfect time to get your house in order. 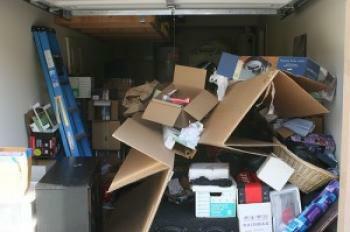 Here are some handy tips from Helpiammoving.com to help you have a happier and clutter free home. Don’t put it off. Take the task in hand; and start today. Set yourself a time limit, however small this maybe and stick to this. Ideally try to declutter over the weekend, this way you can make a mess by pulling out all cupboards and having a really good clear out. Use the four box method. A popular method for decluttering is to apply the four box method, (well 3 boxes and a bin liner) which forces you to make a decision. Take three boxes and label them: Keep and Use, Give Away or Sell, Keep and Store. Use good quality boxes that won’t fall apart and can be easily stacked. www.helpineedboxes.co.uk has a good range. Think logically. Try to work in one room at a time, rather than the whole house. This way you can keep control. Use the bin liner to throw any broken or damaged items. Go around your house and place each clutter item into the appropriate box. sometimes, but you can’t be attached to every little memory. Pack very personal keepsakes in a special box so that you can easily have them to hand rather than all round the house. Be ruthless. If you haven’t used it for a year then get rid of it. Do you really need 3 sets of dinner plates? Box it up it and sell or give to charity. With clothes if it doesn’t fit, then throw it out. There are 2.4 billion pieces of clothing lying unworn for an entire 12 months (some brand new) cluttering the nation’s wardrobes, according to UK Government statistics. Get Shredding. Getting rid of years and years of paperwork is probably one of the most satisfying parts of decluttering. File all appropriate paperwork which is less than four years old and get rid of any old bills, policies papers which are no longer active and out of date. Do not however just bin them always shred the paperwork andand maybe use as packaging if packing up boxes. Information on old bills can be used fraudulently; even if paperwork is torn up it can be easily pieced back together. Staying decluttered. Decluttering is a way of life, adopt a new habits of saying ‘one in, one out’ every time you buy something new. Where do you put it all. At the end of your session take the give away or sell box straight to the charity shop or round to a friends or families house, this way you will not forget the box and end up with more clutter. Take your throw away items straight away to the bins to prevent any second thoughts. Author haywoodPosted on 27th March 2019 27th March 2019 Categories DeclutteringTags clutter, de-clutter, declutter, sping cleaning, spring cleanLeave a comment on De- clutter and spring into Action.